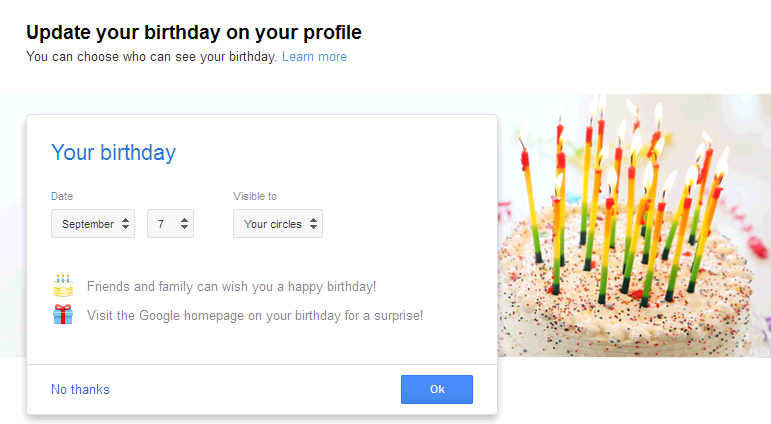 Starting today Google will start showing birthday reminders of your friends on its search engine’s Home page . If you didn’t get a chance to log into Facebook ( which also shows birthday reminder) , don’t worry Google is there to remind you about a friend’s birthday. To get the reminders, you need to be logged into your Google account and then Google will show the birthdays of people who in your circles. This feature also allows you to wish them on their Google+ Profile. If it’s your birthday then people in your circles will be reminded about it. But one good part here is that you can choose group of people with whom you want to share your birthday. By default it will be shared with all your circles but if you want to change and update your birthday, go to Google’s Birthday update page. Here you can update the day you came on this earth and also customize the circles/ people whom Google will remind about your special day. Currently this feature is available to users who are searching in English and will be rolled out gradually over the next few days. Thank you for reading Google To Remind Friend’s Birthday Now on Survival Guide. Why not Like us on Facebook and Follow us on Twitter.